Decorative 4mm balls in pearl lace. Our small tubs of balls means you can create your own colour combinations too. Simply mix your own colours together for unique effects. 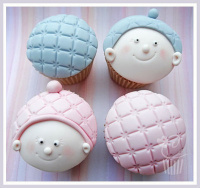 Perfect for adding decoration and texture to your cupcakes. Use edible glue to stick them.